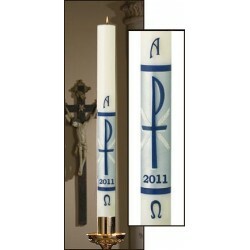 Paschal Candles There are 31 products. Classic Collection 51% Beeswax Paschal Candles are created in the tradition of classic and contemporary design. Classic Collection 51% Beeswax Paschal Candles are created in the tradition of classic and contemporary design. Includes a set of five wax nails with imbedded incense and year dates. PLEASE SELECT DESIRED SIZE FROM DROP DOWN MENU FOR CORRECT PRICING. Paschal - Holy Trinity (SCULPTWAX Collection). Exclusive SCULPTWAX candles are meticulously and skillfully decorated with rich, hand-cast, color-infused wax. The beautifully symbolic, high-relief appliques create a strikingly unrivaled three-dimensional quality. PLEASE SELECT DESIRED SIZE FROM DROP DOWN MENU FOR CORRECT PRICING. Paschal - Christ Victorious (SCUPLTWAX Collection). Exclusive SCULPTWAX candles are meticulously and skillfully decorated with rich, hand-cast, color-infused wax. The beautifully symbolic, high-relief appliques create a strikingly unrivaled three-dimensional quality. PLEASE SELECT DESIRED SIZE FROM DROP DOWN MENU FOR CORRECT PRICING. Paschal - Easter Glory (SCULPTWAX Collection). Exclusive SCULPTWAX candles are meticulously and skillfully decorated with rich, hand-cast, color-infused wax. The beautifully symbolic, high-relief appliques create a strikingly unrivaled three-dimensional quality. PLEASE SELECT DESIRED SIZE FROM DROP DOWN MENU FOR CORRECT PRICING. Paschal - Anno Domini (SCULPTWAX Collection). Exclusive SCULPTWAX candles are meticulously and skillfully decorated with rich, hand-cast, color-infused wax. The beautifully symbolic, high-relief appliques create a strikingly unrivaled three-dimensional quality. PLEASE SELECT DESIRED SIZE FROM DROP DOWN MENU FOR CORRECT PRICING. Paschal - Corss of the Lamb (SCULPTWAX Collection). Exclusive SCULPTWAX candles are meticulously and skillfully decorated with rich, hand-cast, color-infused wax. The beautifully symbolic, high-relief appliques create a strikingly unrivaled three-dimensional quality. PLEASE SELECT DESIRED SIZE FROM DROP DOWN MENU FOR CORRECT PRICING. Paschal - The Good Shepherd (SCULPTWAX Collection). Exclusive SCULPTWAX candles are meticulously and skillfully decorated with rich, hand-cast, color-infused wax. The beautifully symbolic, high-relief appliques create a strikingly unrivaled three-dimensional quality.